A driver of a van which ran out of control and rolled on a South Yorkshire motorway failed a roadside breathalyser test, it has been revealed. The motorist was travelling along the link road from the southbound M18 to the northbound M1, near Rotherham, when the van rolled - causing a passenger to be thrown from the silver van. The air ambulance landed at the crash scene, with the driver and passenger initially believed to have suffered serious injuries. They were taken to hospital but their injuries were not as severe as first thought. 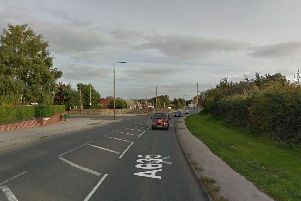 A South Yorkshire Police spokesman said: "The driver of the van was breathalysed at the scene. They failed that breath test. "As the driver had to go to hospital to have their injuries treated, we had to request a blood sample from them there, rather than a further breath sample in the cells. "At the hospital, the driver refused to provide any sample, and was in fact entirely uncomplimentary towards both the police officers dealing them and the medical staffing looking after them. "Fortunately, both the driver's injuries and those of the passenger that was thrown through the driver's window as the rolled are much less severe than we first feared. The other positive thing about that is that the driver can appear in court sooner than we first expected." He added: "Once the driver had sobered up a little, they were interviewed by our night shift and reported on summons for various offences, including failing to provide a sample when lawfully required to do so. "We will be speaking to witnesses over the next few days and weeks to establish what other offences we can prove. "Again thank you to everyone that stopped to try and help the people in the van, and apologies if you were stuck in the congestion that followed."